As we all know, developer Ubisoft took a brief hiatus from Assassin’s Creed last year after it became apparent that franchise fatigue had sunk in harder than a hidden blade from a tall building. The result of this “lost year” was Origins, a new take and a fresh start for the series that has transported us back to the time of pyramids and pharaohs. It has been touted as a new direction for the shadowy organization (the Brotherhood, I mean, not Ubisoft). I suppose, then, that the question that I ought to be answering is: did that year off actually pay off? A classic pose. Edward would be proud. Let’s start with the combat, given that it’s seen the biggest revamp since ACIII. I am unashamedly fond of it, particularly once the more exotic fighting options open up on the new skill tree; the thrill of locking heads with a well-matched opponent is never more prominent than when you actually have to wait for an opening or time your blocks and dodges to perfection. My only real concern was that the game began to lose its traditional stealth element a little once it became apparent that for the most part, going toe to toe with an entire garrison was perfectly feasible. 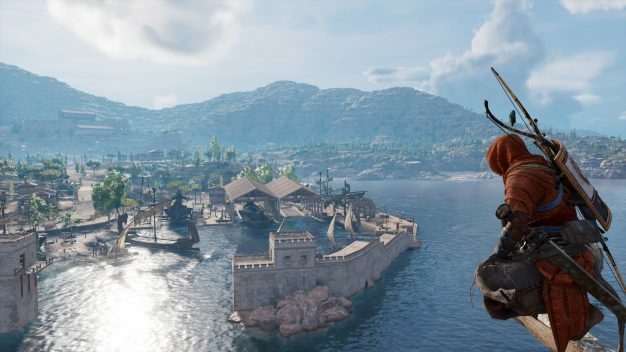 The skill tree doesn’t cater for specific builds, but that isn’t an issue – building a two-handed thug in an Assassin’s Creed game would have missed the point somewhat. Grab the ‘chain assassination’ skill whilst eyeing up the ‘shield bash’ skill; learn to tame animals whilst also doubling the power of your overcharged rage attack. It’s all about choosing the skills that suit the moment, or indeed simply the ones that take your fancy. So, you’ve figured out that I’m using my own Photo Mode pictures in an effort to seem cool. What you gonna do? 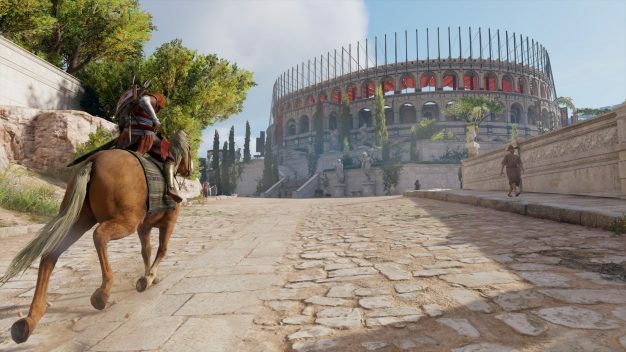 Origins opts for the traditional approach to Assassin’s Creed stealth, ditching social stealth (hiding in crowds or on benches) and focusing instead on creeping through bushes and whistling at guards. But if you want to create a diversion, you can loose a lion on an unwary encampment, start a fire, or even poison a dead body and start a plague worthy of the Old Testament. Distant enemies can be dispatched with a well-placed arrow; if you want to catch a guard isolated, wait for him to be taken by the call of nature in the direction of his bed, a hot meal, or the designated toilet. I’ll admit, I missed being able to evade a guard in an angry mob, or by leaning nonchalantly against a wall. 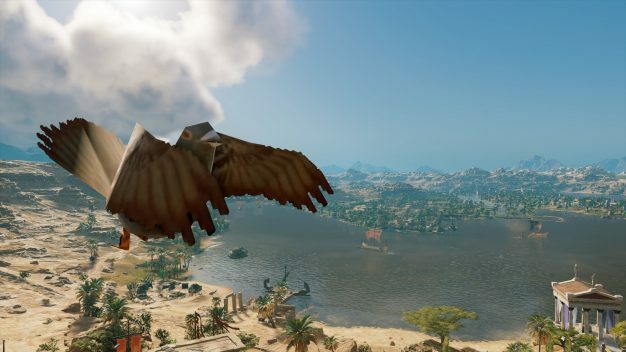 And despite her undeniable charisma, I felt a little short-changed by the literal replacement for the series’ famous Eagle Vision; Senu was an absolute necessity 100% of the time, and it could become a little tiring to have to continuously circle an encampment looking for guards from above. Of course, Senu was only really implemented to show off the game’s dazzling good looks, but we all knew that. But hey, so far, so good: Origins improves on or does away with the precedent set by its elder siblings, refining the stealth whilst bringing a novel challenge to the combat. But it was not the sneaking, or even the hacking-and-slashing, that lifted Origins above so many previous Assassin’s Creed titles. It was instead the sheer depth offered by its beautiful world that kept me in a constant state of amazement; the sense of life that pulsed continuously through its veins. 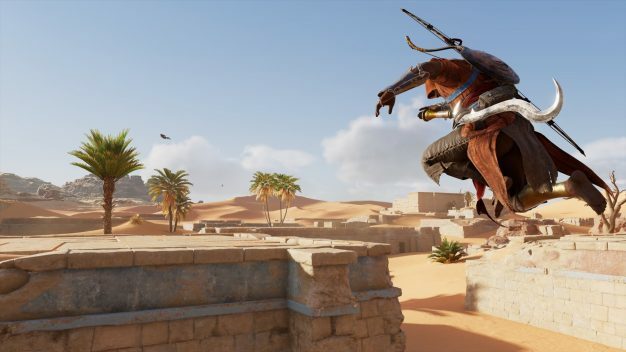 For example: Bayek is sneaking through a small enemy camp, looking for the guarded entrance to an underground crypt. The land is flat, the guards numerous, and there’s not a haystack in sight. All in all, he thinks, the odds are looking pretty slim. Wait. Wasn’t that in Brotherhood? He’s just gearing up for a messy sword-fight when, all of a sudden, a group of mounted guards come thundering through the front gate. A quick glance from Senu’s perspective reveals that they are in the process of ‘fighting;’ moments later, their adversaries burst through the entrance, a bunch of bandits who have clearly ambushed the patrol on the road. Chaos ensues. Ptolemaic soldiers and Egpytian highwaymen clash in the center of the camp, ignorant of the hooded figure skulking through the undergrowth toward his target. A vase full of oil is broken; a fire engulfs the tents in one corner of the fort. 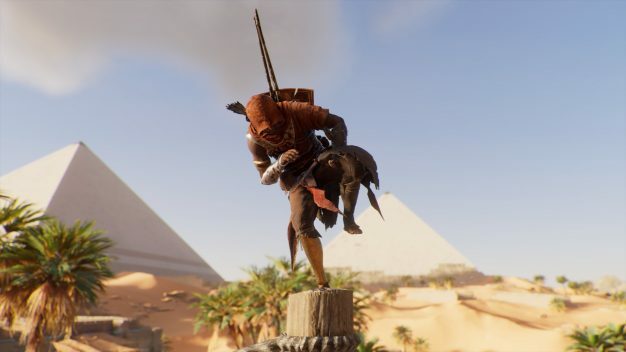 The bandits are eliminated with frightening efficiency, but the danger has not yet passed – moments before Bayek is spotted by the camp Commander, a stray arrow destroys the door of an occupied cage. A mightily irritated lion emerges, and the fighting begins anew. All of this happened without a single moment of input from the player. I’ve not experienced this level of sheer randomness in any action game I’ve ever played, much less an Assassin’s Creed title. It left me with a huge grin on my face and proof that the inhabitants of Ptolemaic Egypt really do act of their own accord. The same can indeed be said of the rest of the vast open world – pause for a moment and you’ll see Roman soldiers lifting crucified victims, or workers counting their produce before heading out back to relieve themselves. 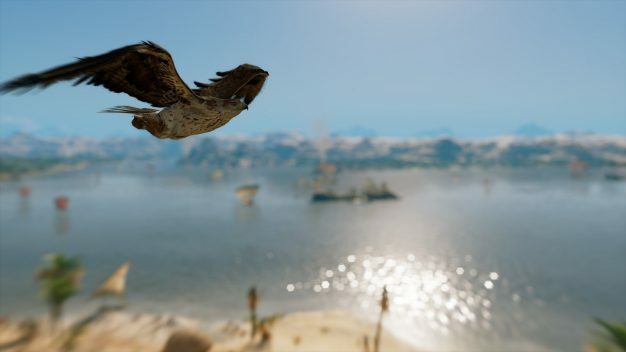 It’s a real shame, then, that the extraordinary world in which Bayek of Rivi-um, Siwa so bravely battles is not blessed with a more powerful tale to bring it to life. Bayek, looking as innocent as a vigilante murderer possibly can. The narrative actually recalls the very first Assassin’s Creed title, where the player is essentially handed target after target to find, research, and then stab with a pointy wrist thing. Things trundle along nicely enough – aided significantly by the charmingly emotive Bayek and his trouser-wearing wife Aya – until the final act, at which point the brakes are stamped and the momentum vanishes. 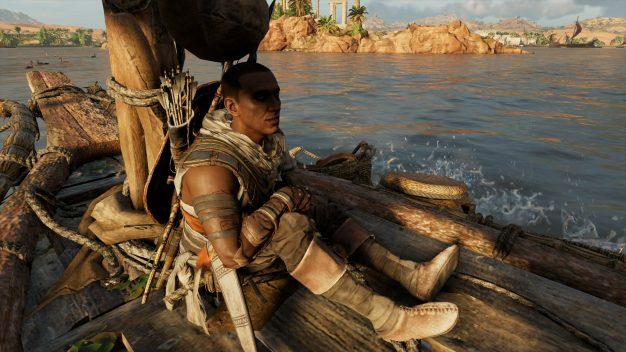 All of the assassination targets in this late stage are individuals you’ve never even heard of, with no discernible motivations or back-stories; it’s hard to watch Bayek get hot under the collar at a dude you’ve met 5 minutes ago. What’s worse is that the prologue is beautiful, a touching finale fit for the couple with whom we’ve spent the whole game living. The passages leading up to the final act are equally strong (until about halfway through), a set piece of narrative movement that departs from the assassination rhythm to deliver something a little more cinematic: how they managed to botch the climactic moments, then, is beyond me. Heck, even the side-quests can occasionally prove more emotive than those damning few missions. Yes, I did take this one. Yes, I am proud of it. Oh, right. In case you were wondering: Origins is quite pretty. Sometimes, it’s better not to look too closely. No, but seriously. I have no doubt that it’s a uniquely faithful rendering of Cleopatra’s Egypt, but more to the point; have you seen this game? It’s astonishing. 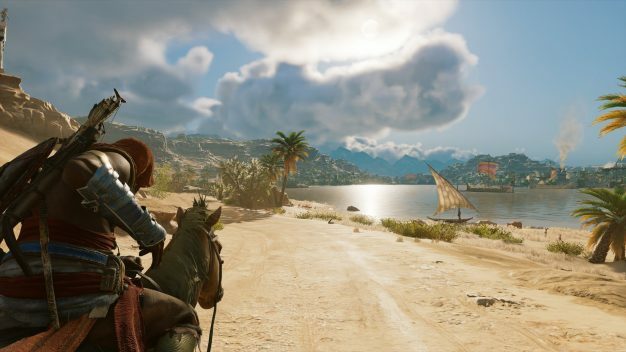 The only thing that really matters when it comes to Assassin’s Creed Origins is whether or not it has reversed the downward spiral into which the series’ reputation had entered. So let’s look at it this way. Origins offers the same magnificent historical backdrop, the same uniquely entertaining mechanics as its predecessors; it employs the same plot devices, touches on the same core world. 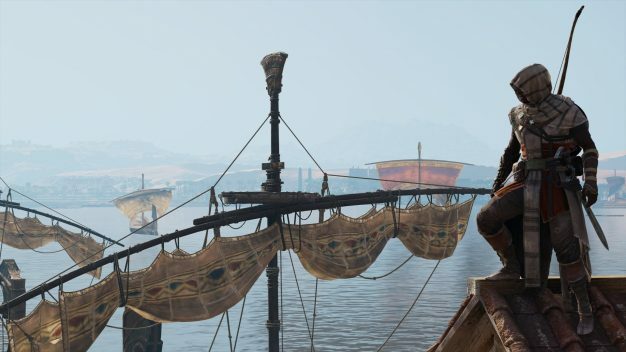 But where previous Assassin’s Creed titles felt a little like they were painting one too many new coats on an old facade, Origins represented a lesson well-learned, sampling its contemporaries and stretching the confines of its genre to make room for a game that offered something truly fresh. 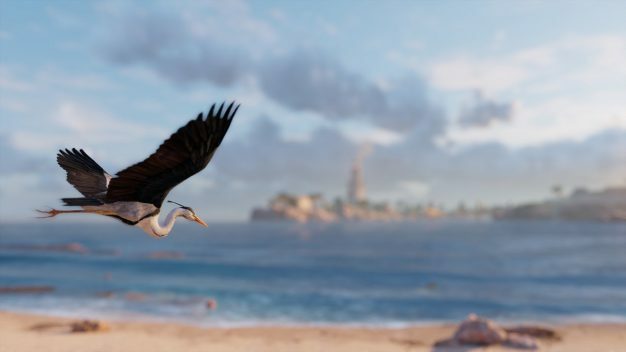 Like the original Assassin’s Creed, Origins is not without flaws, but hey: that’s what sequels are for. Right?